For those that have small children, the task of cleaning teeth is for many is no easy feat. In fact, it has been reported that 42 per cent of parents surveyed faced the nightmare of having to force their children (up till the age of 11) to get brushing, with over 80 per cent throwing tantrums when asked to complete the task. This may very well be contributing to the fact that almost a third of five-year-olds in the UK is now suffering from tooth decay, despite the fact this is preventable. We all know just how important it is to keep teeth clean, but how can you establish good oral health for your kids? As one of the leading dentists in South West London, here is our guide to help you on your way. Another way to form good teeth brushing habits is to get into the habit of brushing your teeth with them. Children are naturally inquisitive, and like to follow the lead of their parents., so let them watch you in a mirror, followed by doing their teeth. It is important to note however that you should brush (or supervise) until they are 7. Brushing teeth needs to be made a stress-free habit, and this can be done by making sure you make babies used to the sensation from an early age so that they won’t find it uncomfortable. For examples, you could put a tiny amount of fluoride toothpaste on a little piece of gauze onto your finger and then wipe it gently onto your babies teeth twice a day. There are many different fun, colourful, exciting toothbrushes available to get little one’s more interested in brushing their teeth. One way of encouraging a child reluctant to brush their teeth is by giving them the choice to decide their own brush. 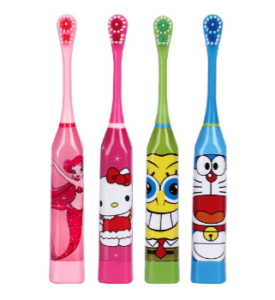 With so many brushes on the market in a wide range of fun characters and colours, this can make teeth-brushing seem far more exciting for a child. It is worth noting that for children up to the age of 6 should be using a toothpaste that has at least 1,000ppm fluoride, and over 7 they should be using a toothpaste with 1,350-1,500 ppm fluoride. Try to make the task as light-hearted as it possibly can be. Perhaps make tooth-brushing part of a game, or invest in a child’s electric toothbrush (though not recommended by dentists for children under the age of three) that can come with flashing lights, music, even some come connected with an app or game too. Generally speaking, you should try to avoid buying strong toothpaste flavours for children, but rather mild minty flavours. Kids don’t tend to really like very strong menthol flavours and the burning sensation that can occur, which could end up making them even less keen to brush their teeth in the future. It is important to make sure that teeth are brushed twice daily for two minutes. One way of achieving this with impatient young children is to set a timer, which makes the whole process far more fun for little ones. This tip is mainly aimed at older children who aren’t too keen on brushing their teeth. These disclosing tablets work by staining the teeth blue, which shows exactly where your kids have not brushed away plaque. Popular with older children, it can provide an incentive to make sure they do a good job brushing. PreviousPrevious post:Welcome to our brand new dental advice blogNextNext post:What do you know about Southfields?